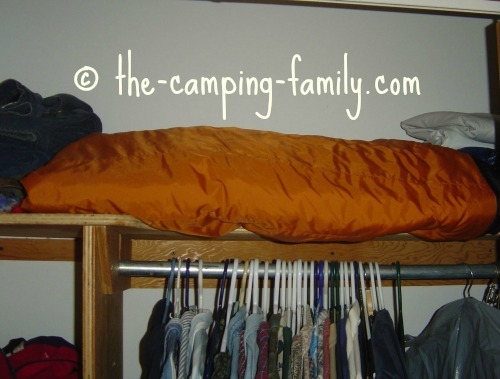 Proper sleeping bag storage is important, but it is often overlooked. Storing your bag properly will prolong the life of your bag, and ensure that it keeps you warm and cozy for many years. Can't I just store it in its stuff sack? 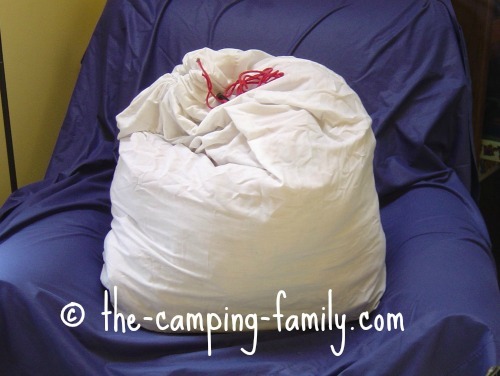 It's true that some sleeping bags come with a stuff sack - but it's not intended to be used for long term storage. 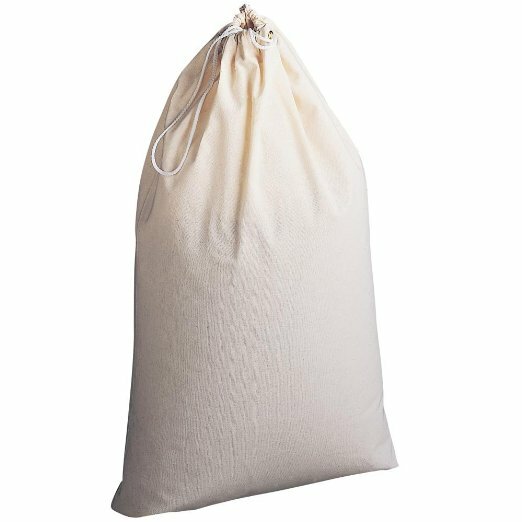 A stuff sack is handy for transporting your bag to the campsite, either in your backpack or in your vehicle, but it should not be used to store your bag once you get home. 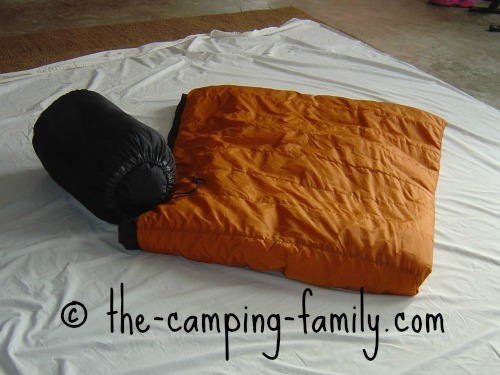 Packing a sleeping bag tightly compresses its fibers, which causes them to break down over time. It's best to store your bag loosely, in a dry place. Your sleeping bag will last much longer if you store it loosely. Fortunately, there are lots of ways to accomplish this. The ideal situation is to hang your sleeping bag from a hook. That's why there are attached loops on some sleeping bags. Air can flow freely around the bag, and the bag is not compressed at all. 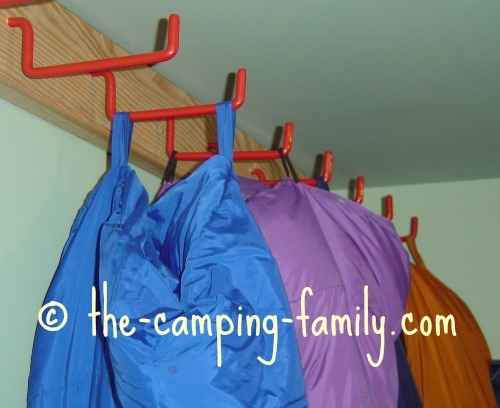 As soon as we moved into a house with a storage room, we put hooks on the wall for all of our sleeping bags. I love that the bags are easily accessible! The big bonus of this system is that the bags can be hung up as soon as we get home from a trip, without drying them out first! Here are the hooks we use. 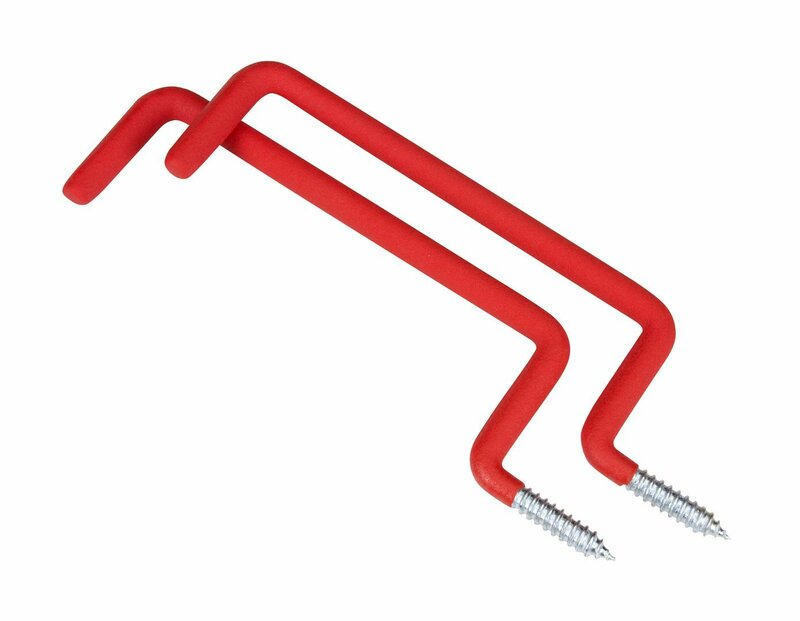 They are actually designed for hanging ladders, but they work perfectly for sleeping bags! 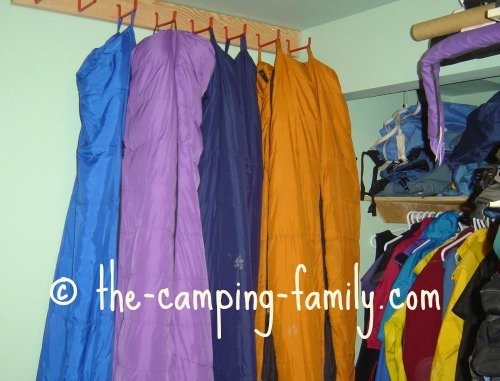 All other sleeping bag storage systems require that you dry your sleeping bag completely before you store it. Folding the bag loosely and storing it on a shelf is a good option. Of course, this requires that you have lots of closet space. In our previous, smaller house, we stored some of our sleeping bags in the back of a closet. My husband sewed a large cotton sleeping bag bag for each of our largest bags. If you don't have a handy husband who can sew custom storage bags, buy a large cotton laundry bag. For smaller bags, you could use a large pillowcase. We had no alternative but to store some of our sleeping bags in the attic. These needed more protection, so we stored them in large Rubbermaid tubs. If you do this, be absolutely sure that the bags are dry and that there is not a speck of moisture in the tub. 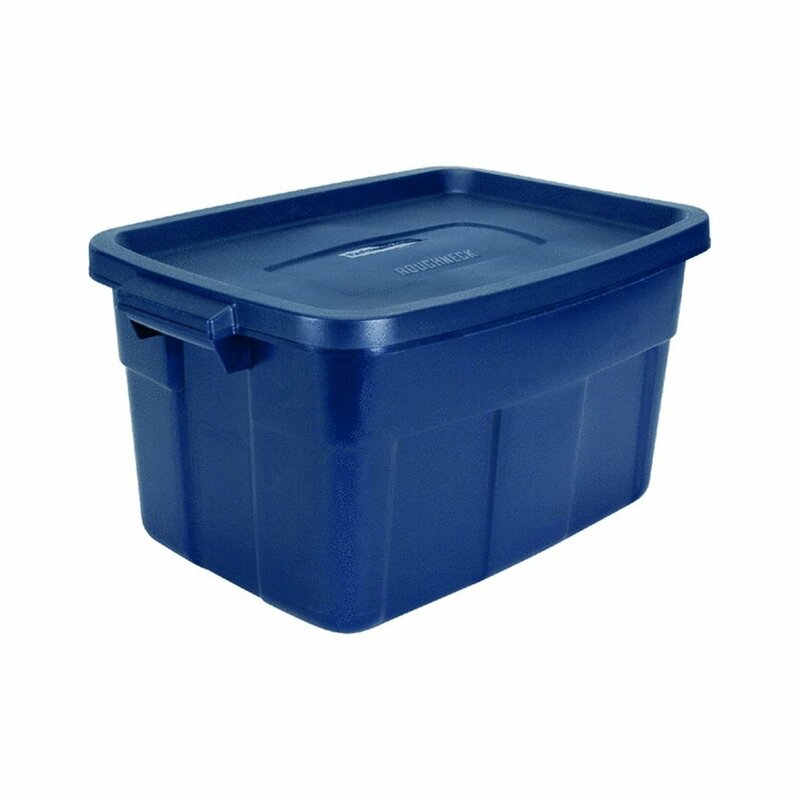 You can never have too many Rubbermaid tubs! 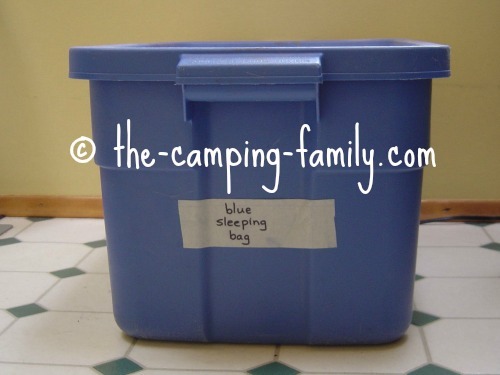 We use them for storing and transporting all of our camping supplies. I have a tub for cooking utensils and pots, a tub for dishes and plates, a tub for food, and a tub for everything else! Storing your sleeping bag properly will help it to last for many years. If you have the room, hang your sleeping bag on a hook. If that's not possible, choose one of the other options and be sure that your sleeping bag is absolutely dry before storing it. 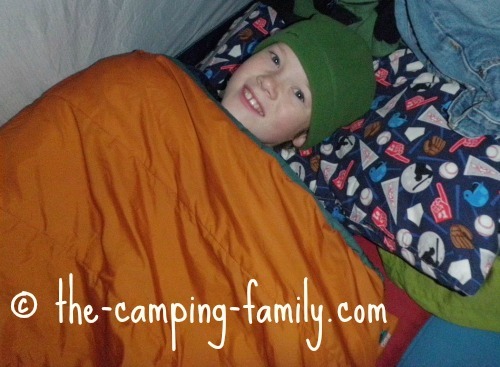 With a bit of thought and care, your sleeping bag will last for many happy years. Now that you know about sleeping bag storage, click here to learn about the different types of sleeping bags. Click here to visit The Camping Family home page, where you'll find help with every aspect of your next camping trip.